Phu Quoc is one of the best places to try scuba diving in Vietnam due to its low depths and relatively stable conditions. Don’t worry if you can not swim or never dive before, you still possibly have a great scuba diving tour and view the breathtaking seascape in Phu Quoc sea in the safest way. 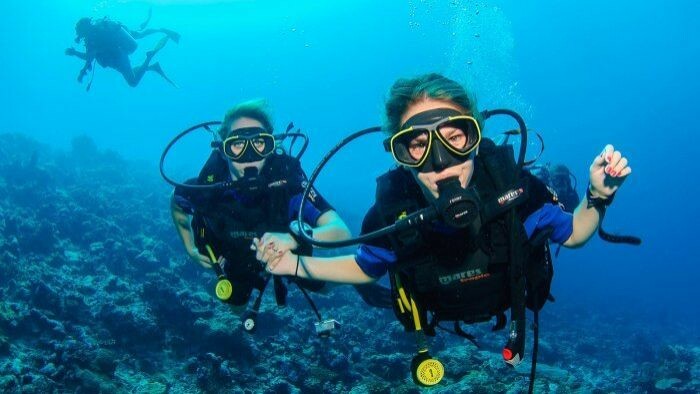 Scuba diving in Phu Quoc is definitely an interesting option that it is worth experiencing for tourists while enjoying a vacation on Phu Quoc island. There are several dive sites in Phu Quoc such as 5 star PADI centers, SSI dive centers and many operators offering you numerous diving tours with the guides who can communicate in English, Russian, Korean, Swedish, Germanese, Chinese, or French. Phu Quoc is the combination of 28 islands surrounded by beautiful coral reefs, but the most comfortable zones for recreational scuba diving are done at the two northern islands adjacent to Phu Quoc island and the southern islands of the southern tip of Phu Quoc island. The sea of these sea zones is shallow and calm with an average visibility of 5 depth meters and water temperature is around 28 - 30 Celsius degree. 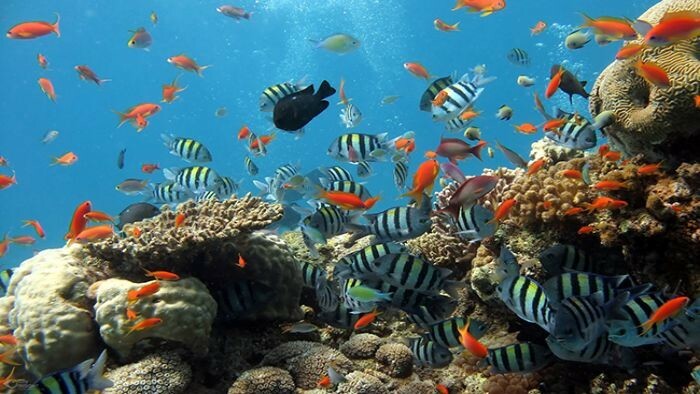 The maximum diving depth in Phu Quoc sea is 30 meters, however, the scuba diving zones are often from 4 - 6 meters which are the most ideal depth for the growth of coral reef. Divers will feel surprised about the fantastic life found in the ground of the ocean and fall in love with the unique underwater topography shaped by a variety of coral creatures. Due to its shallow depths, the sea of Phu Quoc is judged as one of the safest places to learn scuba diving in Asia in an open ocean environment for new learners. Scuba diving to see coral reefs and exploring the undersea ecosystem are activities that many tourists are interested in when traveling in Phu Quoc. However, you also need to prepare carefully diving equipment to have a safe diving trip for yourself. Diving life jacket: This is a must-have item that not only helps visitors float easily when entering the water but also protects your body from scratches when being pushed against the coral or rapids. Life jackets are often designed with striking colors to be able to detect remotely. This is extremely useful for rescue work when an incident occurs. Because of the great utilities that life jackets bring, choosing a life jacket suitable for your own weight before participating in scuba diving is extremely important that tourists should keep in mind. Diving goggles: When choosing diving goggles, visitors should choose the goggles with a wide range of view, soft rubber, clear lenses, and good impact resistance. Good diving goggles will help visitors to see clearly shimmering and fantasy scenes when diving underwater. Propeller: Due to the impact of water flow and resistance, if swimming without the propeller, visitors will lose power quickly. When diving deep, the propeller will help the mobility of visitors greatly increased. Therefore, choosing the right propeller would be extremely useful when diving. Visitors should not choose propellers that are too wide to avoid falling when swimming, you should also avoid propellers that are too tight. Scuba diving gear: Scuba diving gear includes an aqualung, scuba, scuba mask, and diving suits. This is the most necessary items that both protect visitors from scratches by hitting rocks and corals under the sea while keeping visitors breath and warm when soaking in the water for a long time. Therefore, choosing snorkeling gear is also a key factor to have a perfect diving trip. Moreover, small diving items such as hoods, socks, gloves, pressure gauges will also be things that you should be prepared to keep warm and detect abnormalities of the body early. Turtle Island is probably the best site in the north of Phu Quoc, the coral reef of the island runs from just below the surface to 12 m depth. Here you find a big variety of tropical fish and big shoals of fusiliers and damselfish. At a depth of 7 to 10 meters, there is a group of big rocks making the topography of this place very entertaining. At a shallower depth, you can see beautiful hard coral formations with various marine creatures. At low tide, Fingernail island is connected to the mainland which offers a healthy reef down to 10 meters where the site gives way to sand. The sea offers a system of rocks scattered around a flat sandy bottom which is the ideal places for fish such as barracudas and giant pufferfishes. The sandy bottom is also worthy of much attention, through the diving goggles, you can spot octopuses, mantis shrimps, and toadfishes among others. Scuba diving in Phu Quoc is addictive! Many tourists who have booked in for one day of fun scuba diving in Phu Quoc and feel great about this activity. If you are interested in scuba dive, don’t hesitate to contact us right now. Thank you!